In New England, the time to plant garlic is from the middle to the end of October. Now is the time to order garlic bulbs for planting, so contact Johnny’s Seeds (www.johnnyseeds.com/) or Fedco Seeds (www.fedcoseeds.com) in Maine. Once you receive the bulbs, break them into individual cloves and plant them in composted soil 5 inches deep and 4 inches apart. Towards the end of November, cover the area with about 4 inches of mulch. Remove the mulch in spring. ‘Chive like greens’ should be poking up from the ground. Put down an inch of compost and keep the soil moist. In late July or early August when you see that the lowest two or three leaves are no longer dark green, dig up the bulbs carefully. Dry them in a shady spot for a week. 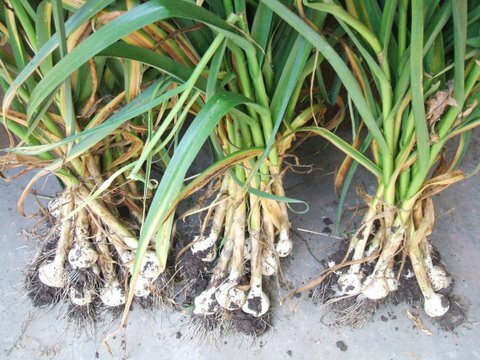 Then cut off the leaves, clean off any soil still on the bulbs, and your garlic is ready to use in cooking!